Compound Living: Otter Pop !!!!!!!!!!!! 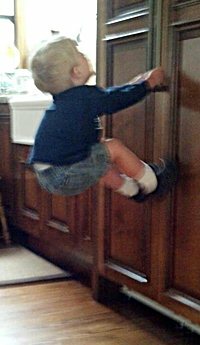 Tracy caught it on film... AJ desperate to get the new fridge door open. He couldn't do it the traditional way (feet on the floor), so he dreamed up this approach, including all the requisite grunting and groaning to go with it. Try as he might, though... No Otter Pop.